Do you ever long for a copy of D.M. Monthly whilst "on the move"? D'you go to more places in one day than the editors do in a year? Then you may benefit from this mobile, fetching, and even "cute" version of your favourite zine. You can have it for free for a limited time! All you have to do is care about us. I.e. comment, just once. Please? Can I have one so that I may keep it in my pocketbook to read on the subway? 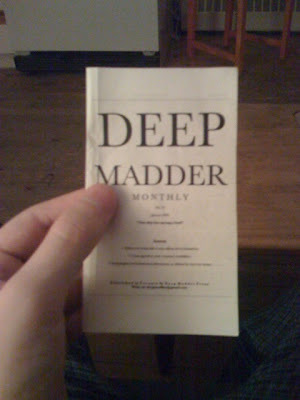 I was actually wondering if you could produce an edition of Deep Madder that would be inconveniently large - something the size of a picnic blanket, approximately. That would be fun to have, a rendition of our makings large enough that upon it we could stage entire picnics. Just don't drop the catsup on my prose! More importantly, who are you, Bernard? I'll take that as a we'll never know.